On August 6, 1915, the 1st. Australian Infantry Division launched a major offensive at Plateau 400 at Gallipoli, Turkey. The ridges were once clothed with Aleppo Pine (Pinus halepensis) however they had been cut down to cover and line trenches leaving one solitary pine. Hence it became known as `Lone Pine Ridge`. In the 3 days of fighting the ANZAC`s lost 2000 men and Turks losses were estimated at 7000. Lance Corporal Benjamin Charles Smith of the 3rd. 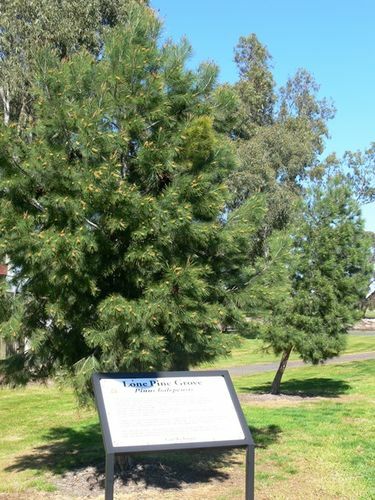 Battalion sent back several cones from this original `Lone Pine` to Australia resulting in one seedling being planted at the War Memorial, Canberra. This grove of Pinus halepensis was propogated from that tree. The grove was planted by the Horsham Returned Services League and the Horsham Rural City Council in 2006.